The Young and the Restless Poll: Will Nikki, Vickie, Phyllis, and Sharon Pay For Killing JT? Thad Luckinbill (J.T.) hasn’t been seen, alive, since last spring on ‘The Young and the Restless’. Mr. Hellstrom’s apparent reappearance was part of Nick’s (Joshua Morrow) ruse that teased what is now leading to the climax of this major storyline. So, how will it end? Someone has sent an anonymously old-school printed, one-line letter to all four members of the cheekily-named coverup crew. Possibly it was Rey (Jordi Vilasuso), Andrew (Coby Ryan McGlaughlin), some unsuspected character, or even the dead man, J.T., himself. With whatever proves true regarding the four-faced jab that’s been taken, one plot point is now clear; a fall stunner seems certain to be delivered to the audience. How Y&R fans react to it depends upon what’s presented. It would be far too easy to have Rey overhear the coverup crew talking about their actions at Crimson Lights, haul them into the police department, and then see Nikki (Melody Thomas Scott), Phyllis (Gina Tognoni), Vickie (Amelia Heinle), and Sharon (Sharon Case) endure no serious legal consequences. Instead, the force of this arc and the extensive amount of time that it’s taken to play out feels as though it’s leading to something more dramatic. All involved in not reporting J.T.’s accidental death, but unlawful burial, deserve to receive measured legal consequences. Nikki and Phyllis could become Lily’s (Christel Khalil) neighbors in prison. Vickie was J.T.’s target and should receive a slap on the wrist, if that. Sharon’s future is more perilous, as she’s knowingly attempting to stymie Rey’s investigation into the case. Her actions in this regard could easily lead to charges, unless Vilasuso’s character goes easy on her. During the climax, or possibly after, J.T.’s body must be found. The fans do deserve closure in that regard. Of equal importance is that Y&R’s writing staff gives devoted audience members a believable result as a reward for following this complex storyline for many, many months. 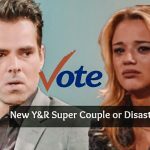 Fans of ‘The Young and the Restless’ rightfully express their opinions on a regular basis. So, how does the J.T. drama end? Please vote in our poll below!